A TSP participant can designate whomever they want as a beneficiary to their TSP account, however, only a spousal beneficiary can choose to leave the funds in TSP. All other beneficiaries must take the funds out of TSP, either by having them paid out directly and getting hit with income taxes, or by rolling them over into an inherited IRA, and taking distributions over their life expectancy. Many TSP participants encourage their spouse to leave the funds in TSP because of the low fees and simplicity. However, it’s important to understand all the consequences. If a surviving spouse of a TSP participant chooses to leave funds in TSP, it becomes a Beneficiary Participant Account (BPA) which has both similarities and differences to a TSP participant account. A BPA owner can take a one-time partial withdrawal, and the balance as a single payment, a series of monthly payments, a life annuity or a combination of all three. There are no early withdrawal penalties associated with a BPA account unlike an IRA. If a BPA account owner is under age 59 ½ and rolls TSP to an IRA, he or she would have a 10% early withdrawal penalty on any distributions taken out prior to 59 ½. If the spousal beneficiary leaves funds at TSP, they can access TSP without an early withdrawal penalty at any age. One of the disadvantages of a spouse leaving funds at TSP, is at their death, any remaining funds would be paid outright to the BPA owner’s beneficiary(s). The money cannot be rolled over to an inherited IRA. Remember, funds in traditional TSP have not been taxed. Distributions are taxed as ordinary income at the beneficiary’s tax rate. This could mean that Uncle Sam gets to inherit a large piece of your TSP. If the spouse had rolled TSP to an IRA in their name, at their death, any remaining funds could be rolled over into an inherited IRA for the surviving spouse’s beneficiaries. Lisa’s husband Larry (federal employee), has recently passed away and had $400,000 in his TSP account. Larry was 65 when he passed and Lisa is 58. Lisa needs to take distributions from this account to meet income needs for her and her two children. If Lisa rolls TSP to an IRA in her name, she will have 10% early withdrawal penalties until she reaches age 59 ½. If Lisa leaves funds at TSP as a BPA, she can access funds without a 10% penalty. If Lisa passes away and still has a balance in TSP, her children would not be able to roll over the proceeds into an inherited IRA. They would inherit whatever was left after Uncle Sam took his share. Lisa is not sure what to do. She really needs to take distributions now, especially because she is not yet eligible for Social Security. She also understands that by not rolling any of the money into an IRA she would forfeit the chance to do a stretch IRA, allowing her children to inherit and take distributions over their life expectancy. Lisa is eligible to do a partial withdrawal if she has not begun taking monthly distributions. Lisa can calculate what she needs to cover her expenses until she turns 59 ½ and leave that sum in TSP. Meanwhile she can roll the balance into an IRA from which she can take penalty free distributions upon reaching age 59 ½ and her children can roll over any remaining balance to an inherited IRA, when she passes. For TSP monthly payments lasting less than 120 months the mandatory federal tax withholding is twenty percent. Another problem is that a BPA holder must use the Single Life Table for calculating RMDs which requires distributions to be larger than the Uniform Lifetable which is used by TSP account owners and an IRA owners. The date that you must begin receiving Required Minimum Distributions depends on whether the deceased participant died before or after his or her “Required Beginning Date (RBD).” The RBD is April 1st of the year following the year a participant reaches age 70 ½ or separates from service, whichever is later. Year of death – A beneficiary participant is not required to receive an RMD payment. Subsequent years – You must begin receiving annual RMDs by either December 31 of the year the deceased participant would have turned 70 ½ or December 31 of the year following the year the participant died, whichever is later. (The Beneficiary Participant account holder’s age, prior year-end balance, and the Uniform Lifetable are used to calculate RMDs). Year of death – In the year of death, a Required Minimum Distribution must be distributed based on the participant’s age by December 31 of the year of death. 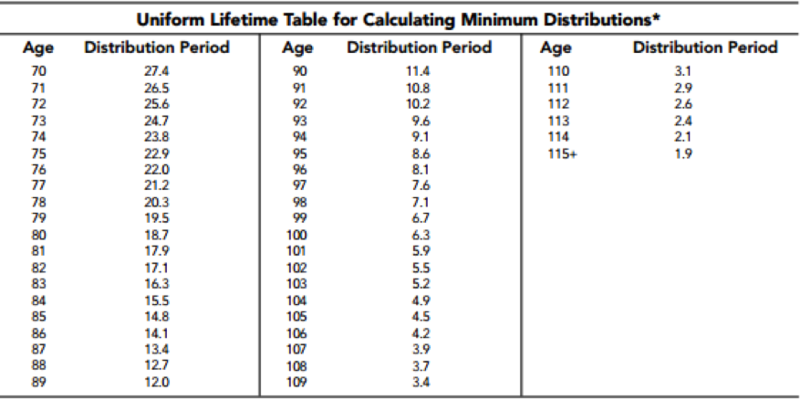 (The deceased participant’s age, prior year-end balance, and the IRS Uniform Lifetime Table are used to calculate the RMD). Subsequent years – You must receive an annual RMD by December 31 of each year following the year of the participant’s death. (The Beneficiary Participant account holder’s age, prior year-end balance, and Single Lifetable are used to calculate RMDs). The RMD calculation for a BPA owner is based on the Single Lifetable which requires a larger distribution to come out. If the spouse rolls TSP into an IRA, the RMD is based on the Uniform Lifetime Table, which is a smaller mandatory distribution. Tony is 72 (DOB 1/5/1945) and his wife Janet, the deceased TSP participant, would have turned 70 ½ in 2017. The BPA 2016 year-end account balance is $400,000 and Tony uses the Single Lifetable to do his RMD calculation. The RMD that must be satisfied in 2017 is $25,806.45 ($400,000/15.5). Tony had rolled over Janet’s TSP when Janet passed away. Tony must take his RMD based on his age 72, not the year Janet would have turned 70 ½, which would mean he needed to take his RMDs earlier than 2017. 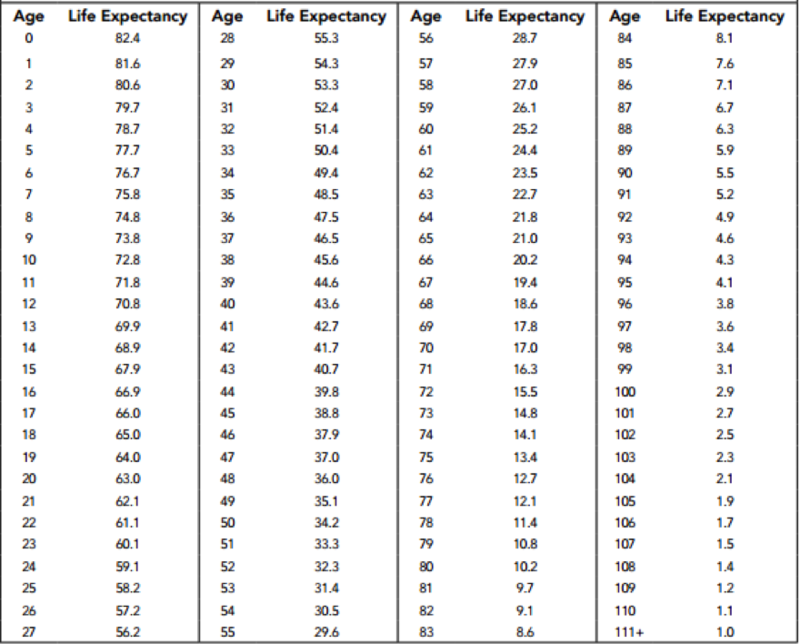 Assuming a 2016 year-end balance of $400,000, Tony’s age 72 and a Life Expectancy of 25.6 from the Uniform Lifetime Table, the RMD that must be satisfied in 2017 is $15,625 ($400,000/25.6). « After Trump: A Surge of Federal Employees Leaving Government?